The following idea 'Decorating' will not be realised due to the early general election in September 2005. Instead, there will be a modified version of the original idea with the title → 'City Gate'. With all means possible, we plan to enhance the Karl-Marx-Straße (the part between U/S-Bahnhof Neukölln and U-Bahnhof Grenzallee) for a short period of time. The departure point for our project is discussion about the so-called "festival-isation" of cities, and our concern that art can sometimes be exploited in the efforts of city marketing boards, as well for the entertainment of consumers. On a five-week trip to Egypt we visited Cairo three times with around two weeks gap in between each visit. The first time, conditions were far more chaotic than we would have expected. Many main streets and squares were difficult to pass due to extensive road works. 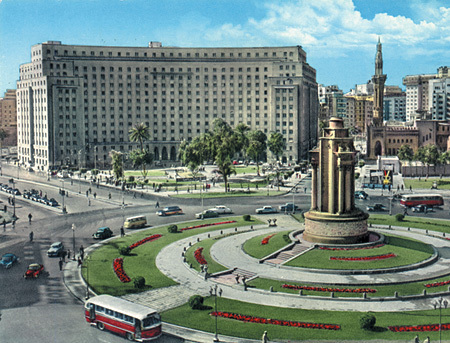 On our second visit two weeks later, the number of road works had noticeably decreased, and dramatic measures had been taken to enhance central squares - especially the Square of Liberation and the Midan el-Tahrir, as well as parts of important main roads. These measures included the repainting of some facades, the introduction of decorative plants (palm trees in particular), and in addition certain parts of the squares were painted green, while the curb was marked in red and white. To us - unaware of what was going on - the obviously provisional measures seemed astonishing. Our final stay in Cairo provided us with the explanation: From the newspapers we learned that, a few days earlier, the first part of the Cairo underground had opened with attendance by a few important foreign politicians. The squares and streets, which two weeks earlier had been hastily prettified, now appeared almost as usual again: The large potted plants had been removed, the small ones had been neglected and had withered - only the green, red and white paint still sparkled. The fabrication of the inner city landscape for a state visit (which generally lasts only a few hours) helps the hosting state present themselves in a good light - not least to deliver a picturesque background for TV images. In this way, not only can the state polish its image toward other countries, but can present a perfect face even to its own heads of state - tyrants, kings or presidents. This phenomenon differs in degrees worldwide. Our own "mirroring of a false fact" has a double meaning - there is no obvious reason for our decorations, neither a U-Bahn extension, nor a motorway opening, nor any state visit.